← Support Sandy Collora’s “Shallow Water”! Trial by stone– oh, wait, wrong film. Sorry. Go on. Keep reading. It was ironic,” Nicotero told Cinefex. “After all the prestigious films Frank had done, and being such a fan of the genre, this was the first time he had an opportunity to design his own creatures. It was an intricate design procedure; and, as I had known him for so long, Frank allowed me to drive that process. 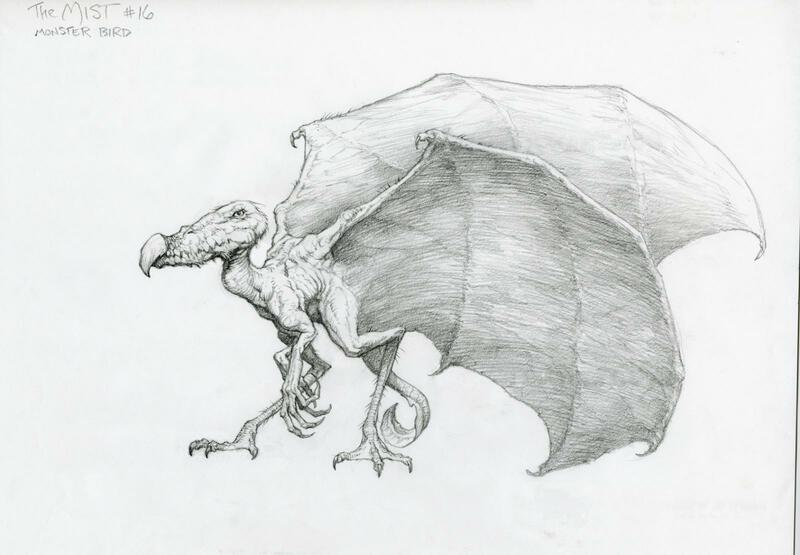 We brought in some great artists — Aaron Sims, Andy Schoneberg, Bernie Wrightson, Michael Broom, Jordu Schell — and I had my own ideas.” Additional concept art was also provided by John Bisson, as well as CaféFX’s Raymond Lei Jin. Concept art by Lei Jin. Concept art by John Bisson. 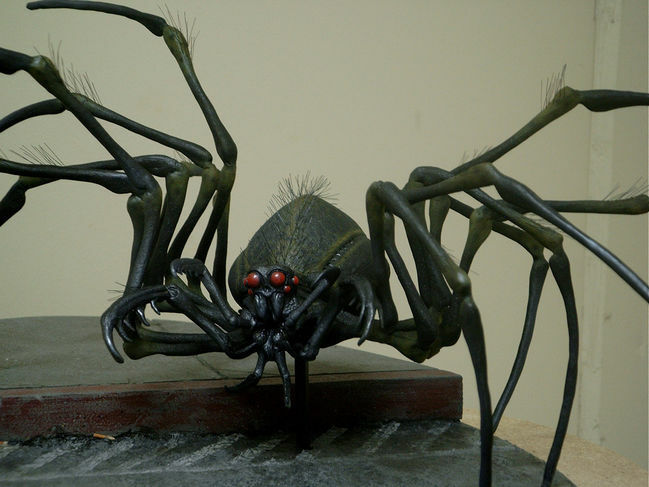 Jordu Schell’s original spider creature maquette. 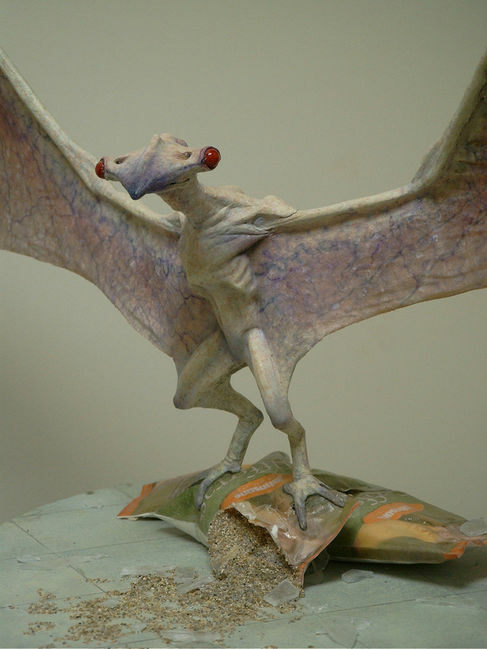 Close-up of the bird creature puppet. 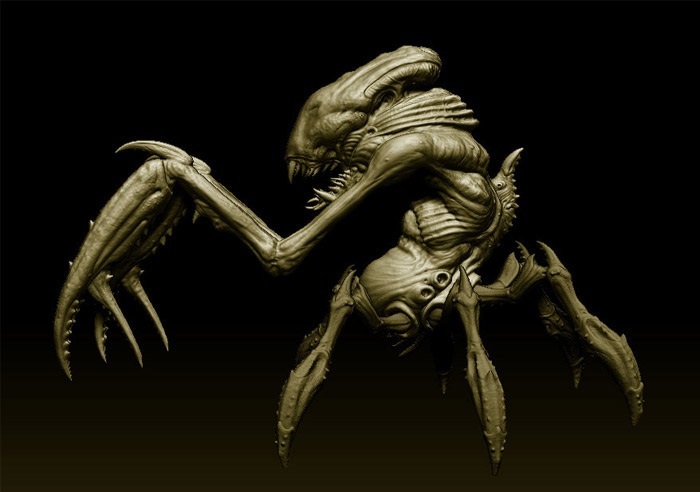 Among the practical effects visible in the film itself are models of the dead, or dying creatures, gore effects, and make-up prosthetic effects. CaféFX’s digital creatures were modeled by Miguel Ortega and a team of modelers, based on reference photos of KNB’s models. The company Crack Creative provided a previsualization camera system that enabled CaféFX to properly integrate the visual effects within Darabont’s documentary-like scenes. The mist and the creatures within it are brought to our world through a portal, opened by the military team of the Arrowhead project. The beginning of the film was initially supposed to portray said accident, but the scene was cut for budgetary reasons. 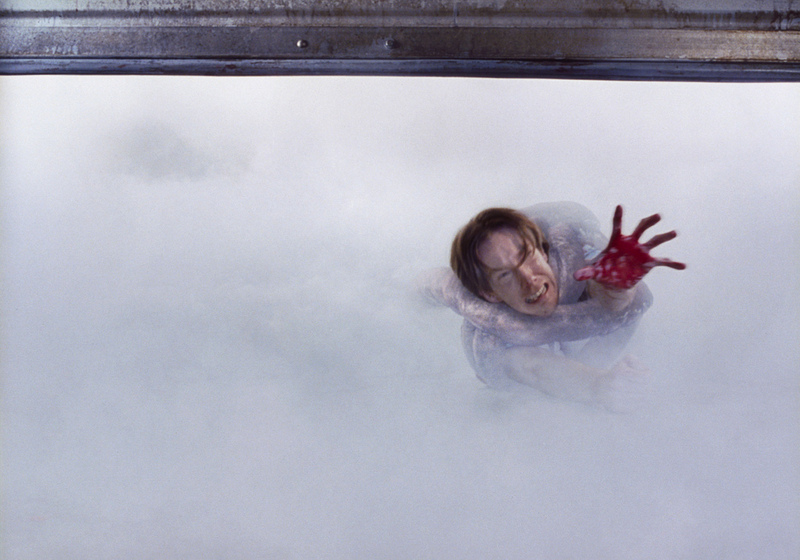 Regarding the film’s titular phenomenon, “Frank wanted the mist effects to look alien, but not scary enough to frighten characters away on first sight,” Burrell said. “He wanted to base the effects in reality. He didn’t mind using CG elements, but he didn’t want to see CG by itself, and he didn’t want to use chemical cloud tank elements. It had to look like an odd natural phenomenon.” Research and development of digital mist elements were led by Akira Orikasa. 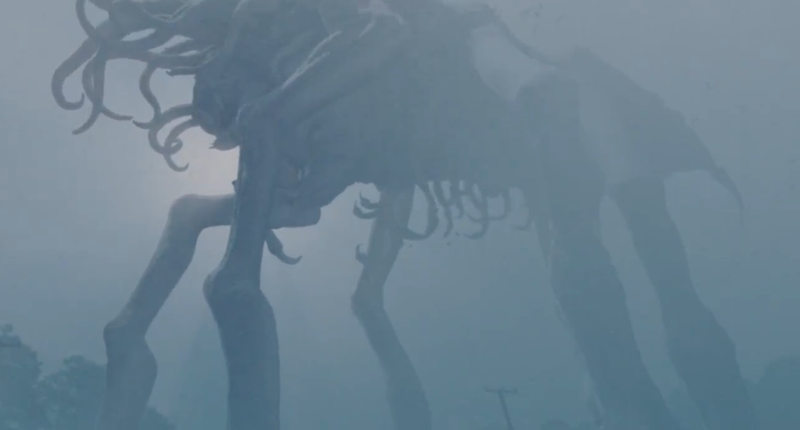 Programs used to animate and integrate the mist elements into the footage included Cebas Computer ThinkingParticles and Ideate FumeFX. Practical dry ice elements were also shot against black screens, pouring vapour over shapes representing objects in the original plates, and then composited into the shots, blending with the footage and the digital effects. 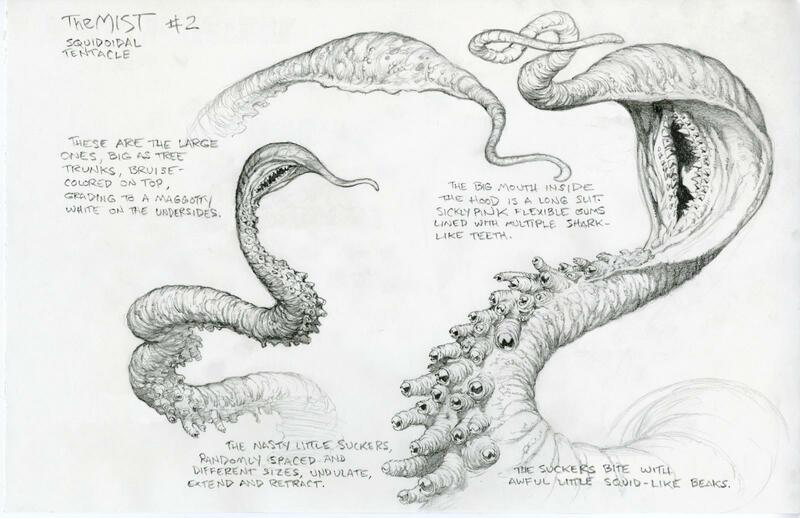 Tentacle concept by Bernie Wrightson. The tentacle animatronics were used as reference for CaféFX’s digital versions. Burrell recalled: “the intent was always to have the tentacles half CG and half practical, but when we got on set, Frank wanted them to move really fast and have an organic earthworm-like undulation that the puppets couldn’t do. 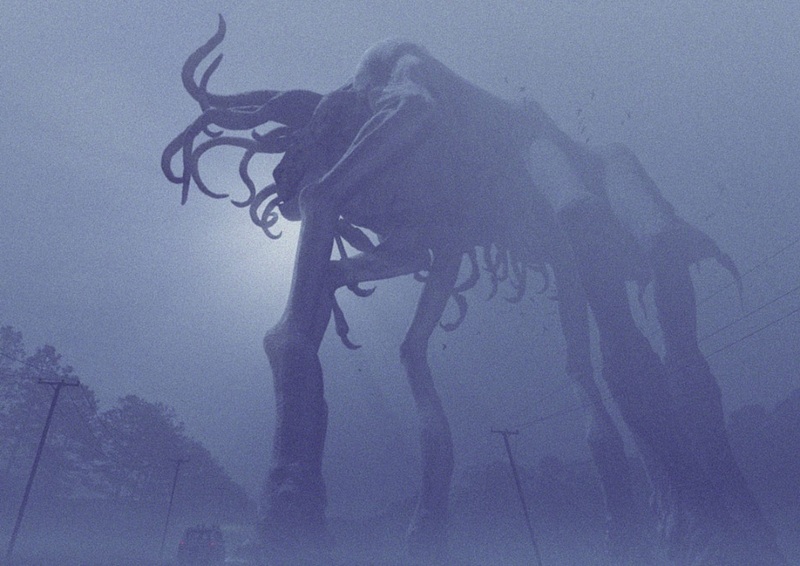 KNB did a great job on the tentacles artistically, and they were very useful for the actors on set, but we replaced most of them digitally.” Composition of the visual effects was aided by LED and fluorescent tape tracking markers on set. Mike McCarty paints one of the tentacles. One of the reference bugs. 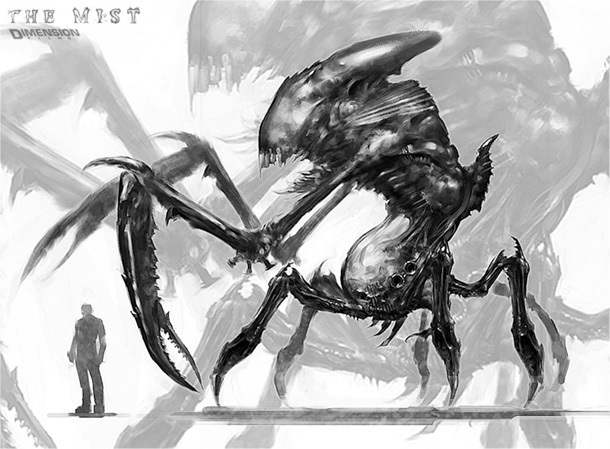 Next to appear in the film is a swarm of insectoid creatures. Compared to their novel counterparts, the Bugs were conceived to be more arthropod-like and dynamic. 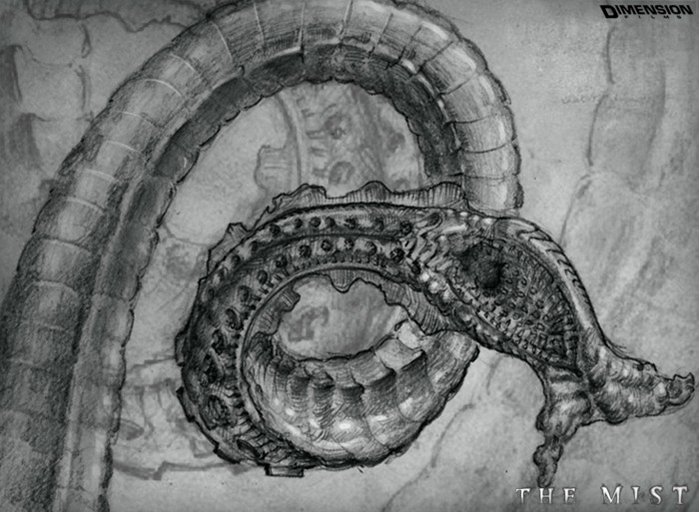 Wrightson’s design was based on electron microscopy images of insects, as well as reference photos of scorpions and crabs. Gino Crognale and Jaremy Aiello sculpted the creatures in full size — 18 inches of length — and produced reference models in latex, fiberglass and vacuform that were also able to adhere to windows. 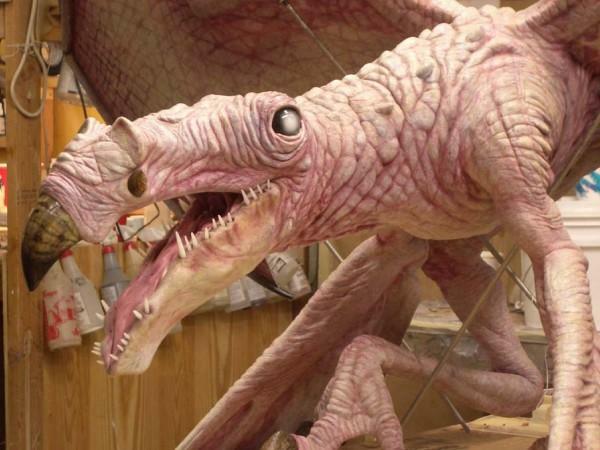 Close-up versions with articulated head, eyes and mouth were instead mechanized by Jeffrey Edwards and his team. 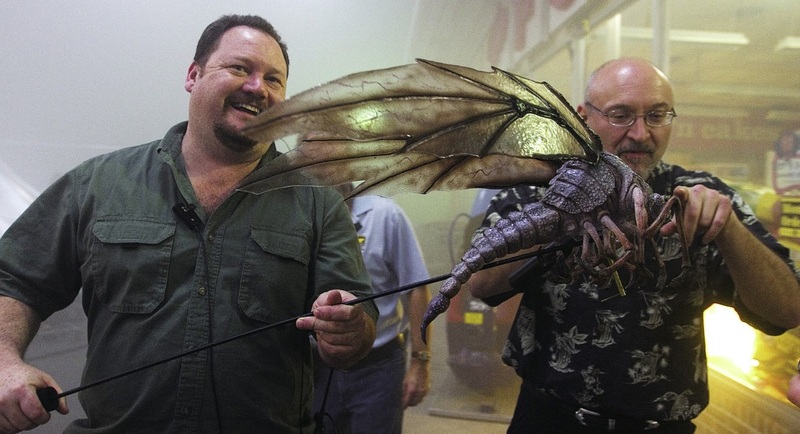 Burrell and Darabont with one of the reference bug creatures. Early design maquette by Jordu Schell. Shannon Shea paints the bird creature puppet. 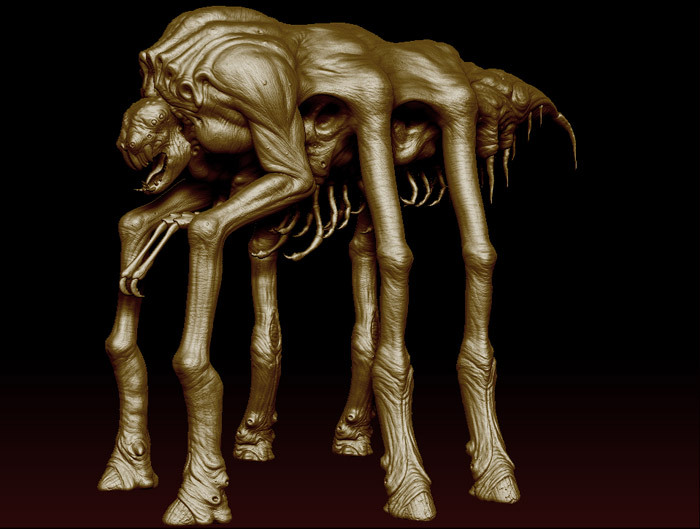 The maquette of the Monster was sculpted by Schoneberg. 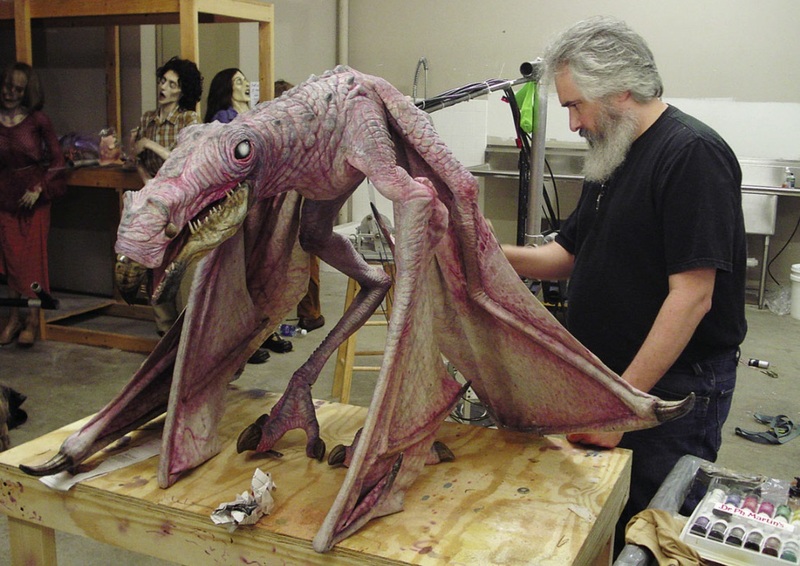 The same artist, with Aki Horohito and Steve Koch, devised a full-size animatronic with a wingspan of eight feet, maneuvered with a boom arm. “We locked down the feet,” Nicotero said, “and the boom arm moved the creature up and down, or side to side. The neck was on a four-way cable, so that could move side to side and up and down. The jaw was a three-part mandible, radio-controlled. It had circular eyeballs on slight stalks, and we took a cue from nature to make it blink like a bird. We rigged a radio-control mechanism that pulled the eyes back through a silicone section in the head, and the weight of the silicone closed the lids around the eye.” The wings were rod-maneuvered. 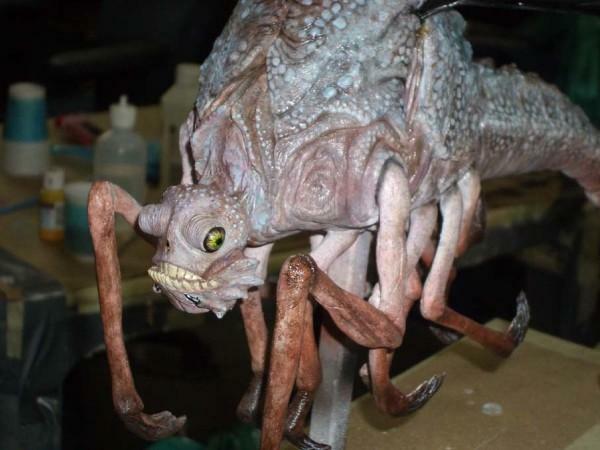 A hand puppet version was also built for insert shots, and dummies of the shot or charred creatures (cast in silicone and polyfoam) were constructed. 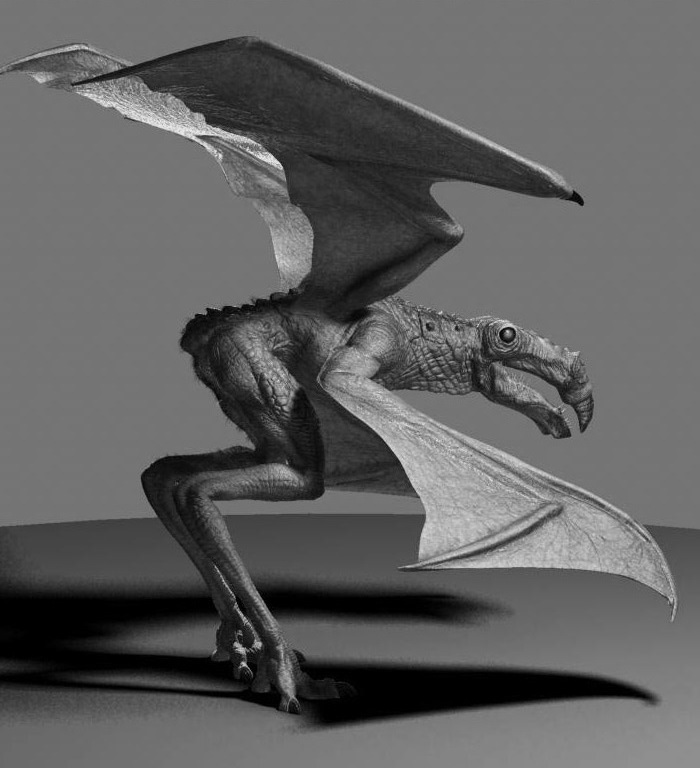 Miguel Ortega’s digital bird creature. In post-production, most of the models were replaced with the digital versions. CaféFX used luminance keys and difference mattes to place digital Monsters behind practical glass-breaking effects and rotoscoped 3D flashlight beams to light the entire scene. 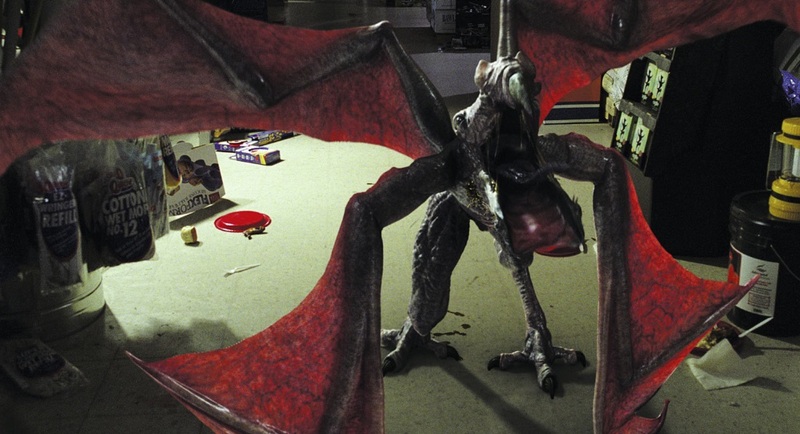 Real fire elements were filmed in the supermarket set to portray the burning creature set ablaze by Drayton. The spider-like Monsters first encountered in the pharmacy were initially designed by Jordu Schell in maquette form — in a configuration that closely followed the description from the novella. Darabont, however, decided to stray from that design. Nicotero recalled: “Frank wanted the Spiders to have an almost human grinning face. 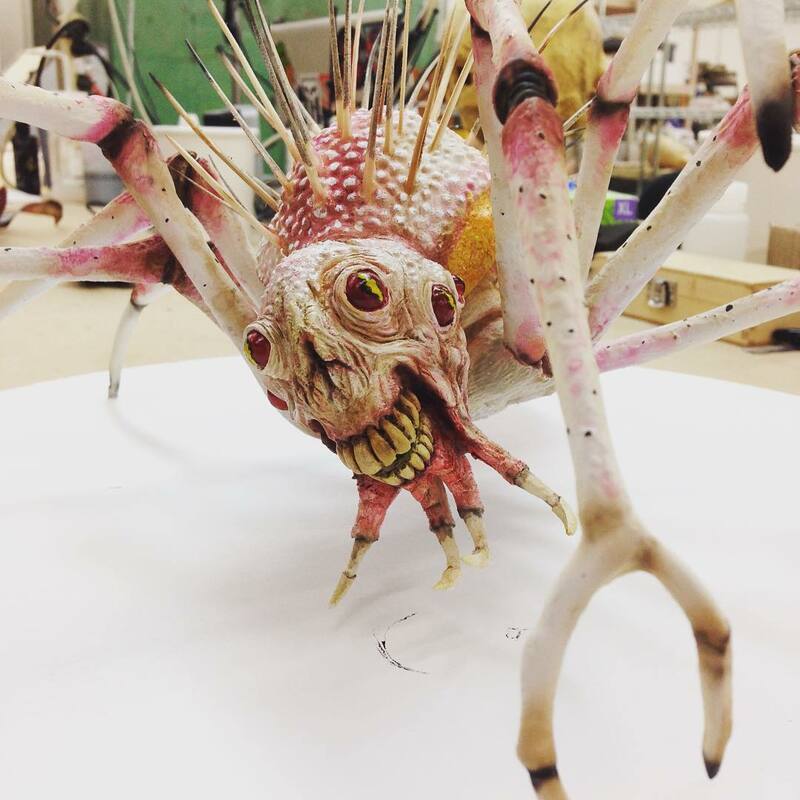 We didn’t want it to be literally a guy’s head stuck on a spider’s body, like The Zanti Misfits, so Mike Broom and I came up with a design that looked like a grinning death’s head when the Spider closed its mandibles over its mouth.” An animatronic version of the Spider was built by Mike McCarty (who also devised the creatures’ colour scheme), Jake McKinnon and Rob Derry, and operated by Jeff Edwards. 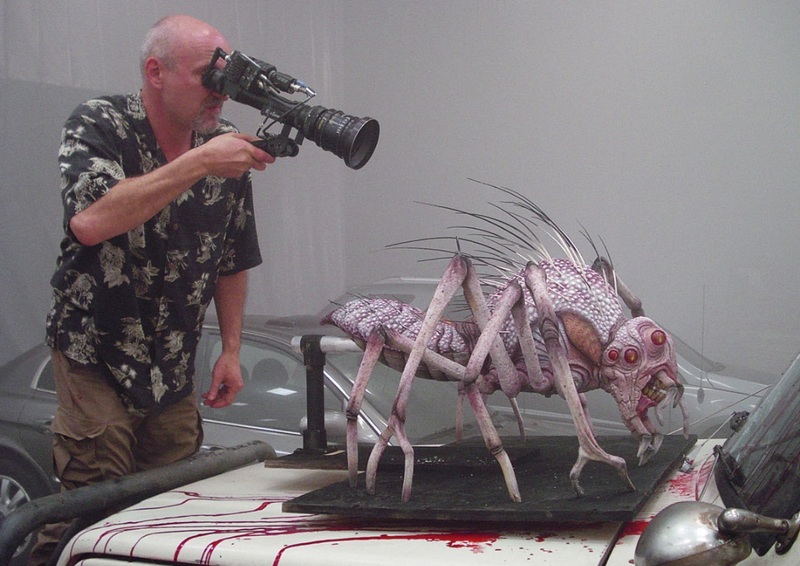 Darabont films the spider creature puppet for reference. 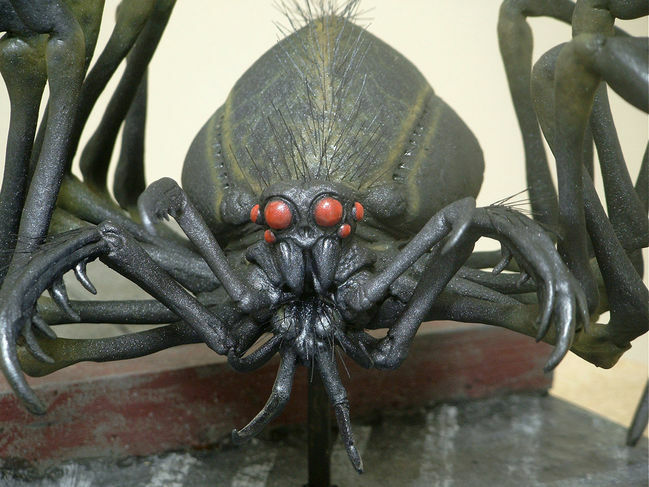 Prosthetic make-ups portrayed the victims of the Spiders, which are parasitoid and lay their eggs inside hosts. The prosthetics included chest extensions with gelatin blisters and bladders, which were digitally augmented to portray the baby Spiders erupting from the host’s face and body. 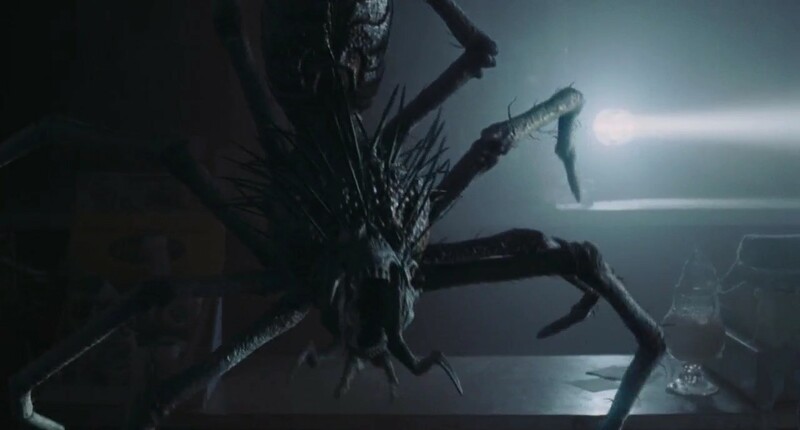 When the victim falls and the baby Spiders are released from his back, a practical dummy of the actor was filmed, with digital Spiders added in post-production. Raymond Lei Jin’s design was translated into a digital model by Miguel Ortega. As the group of survivors runs out of the supermarket, Ollie is snatched by an enormous crustacean-like creature — the only Monster in the film whose final design was devised by one of CaféFX’s artists. Burrell said: “our resident concept artist, Lei Jin, worked up the design. It was a low, scuttling thing, with big lobster arms. […] We see Ollie pulled up into the mist, kicking in silhouette. A big maw opens, chomps down and then pulls away and leaves just legs dangling. It’s all CG, even the blood landing on the car.” The mantis-lobster is perhaps the design that has taken the most liberties with the description offered in the original story. “A shadow loomed out of the mist, staining it dark. It was as tall as a cliff and coming right at us. […] It may have been the fact that the mist only allowed us to glimpse things briefly, but I think it just as likely that there are certain things that your brain simply disallows. […] It was six-legged, I know that; its skin was slaty gray that mottled to dark brown in places. Those brown patches reminded me absurdly of the liver spots on Mrs. Carmody’s hands. 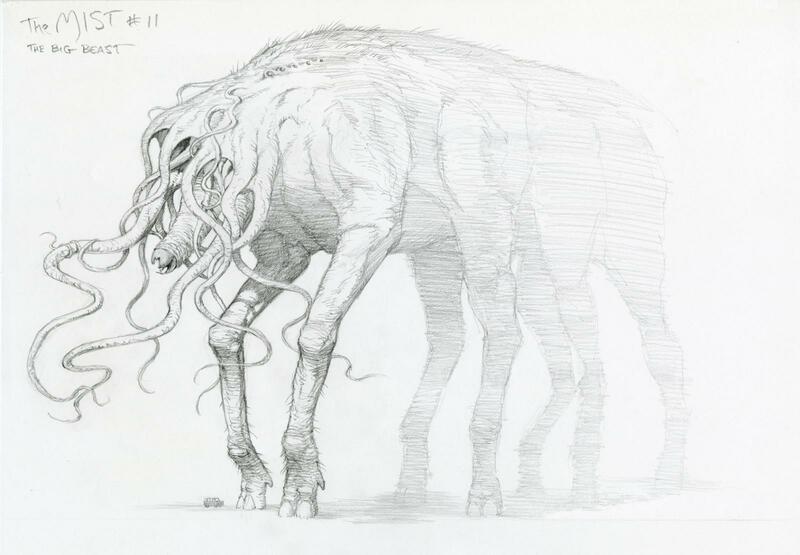 Behemoth concept by Bernie Wrightson. The digital model under construction — without the tentacles. 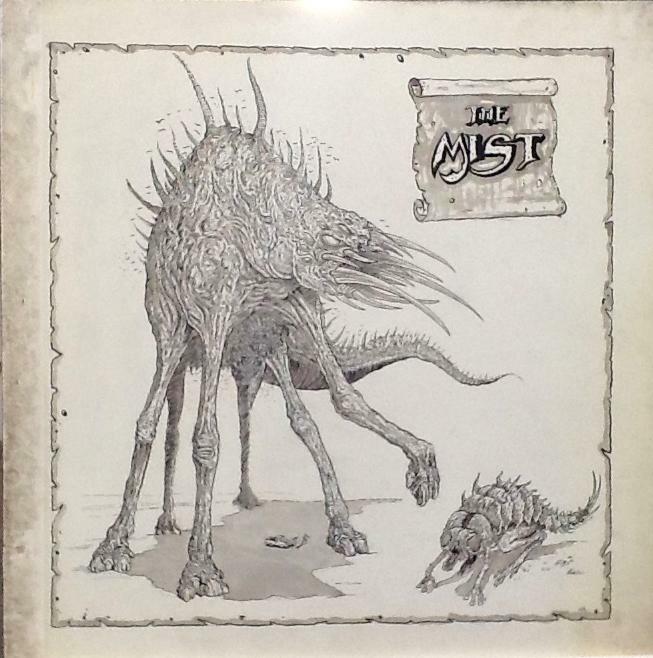 For more images of the Monsters in the Mist (if you can see any with all that fog), visit the Monster Gallery. 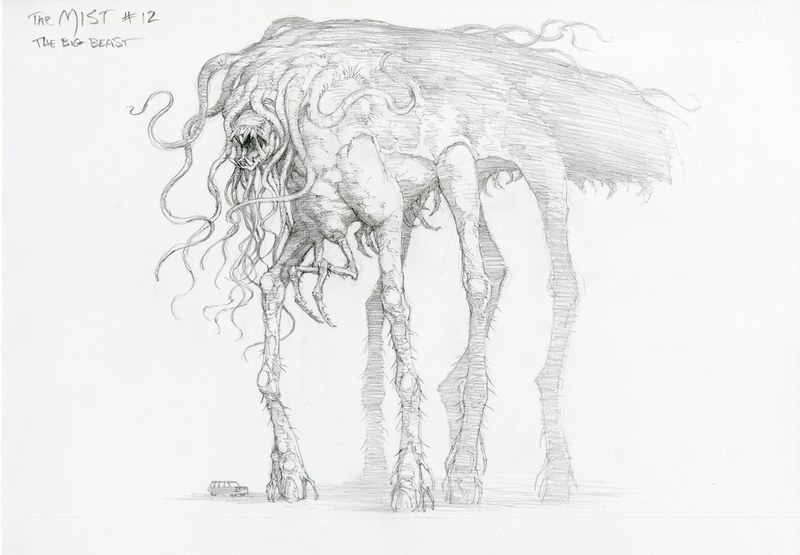 Posted on 09/09/2015, in Movie Monsters and tagged Bernie Wrightson, CaféFX, Everett Burrell, Greg Nicotero, Jordu Schell, KNB Efx, Lovecraft, Stephen King, The Mist. Bookmark the permalink. 5 Comments. 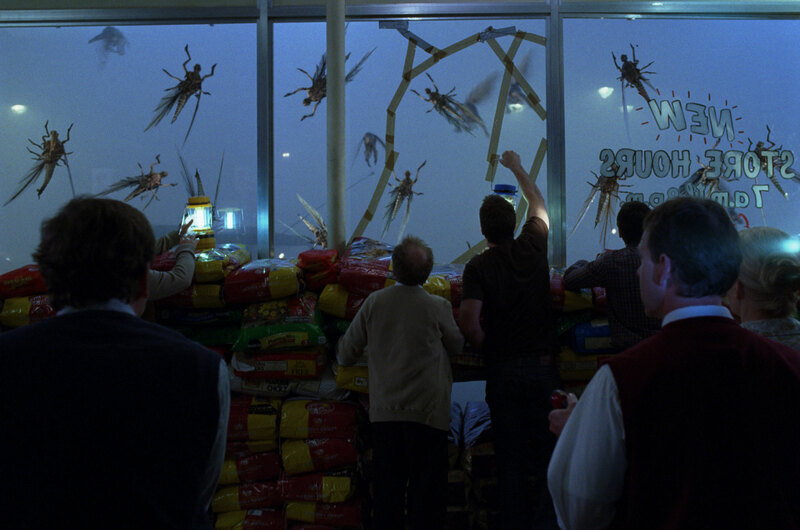 My favorite memory of this movie was my mom jumping out of her seat when the first bug flew and landed on the shop window. Such a great film with unique creatures. Thanks for writing this, I really enjoyed it. 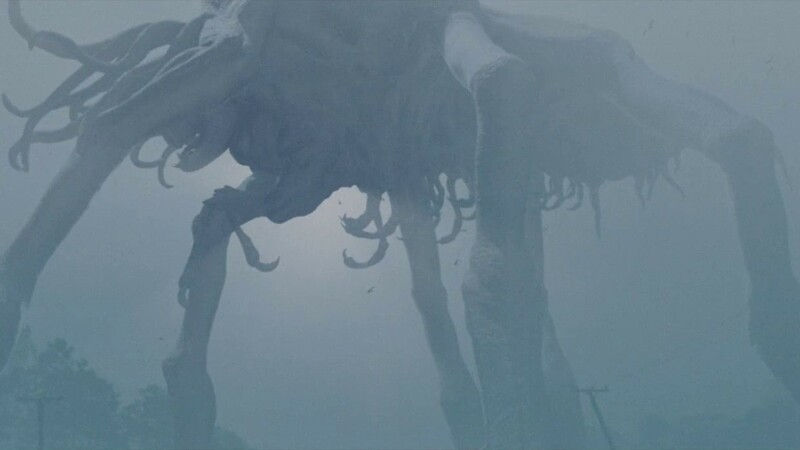 Just came across this article while listening to the audio version of The Mist. I love monsters. I love the movie too. Great post.